Over the years as an entrepreneur I have built a plethora of useful skills. I would imagine any entrepreneur ends up doing the same since we all wear 17 different hats at once. Let me explain, when I started my agency I had zero experience in any form of marketing. I am a college drop out with a background in massage therapy. I personally have never valued formal education but am a huge proponent on learning through real world experiences and asking others. Since day 1 of my agency I knew I had some extra work ahead of me. All my competitors had degrees or years of experience, so I had to bet on my strengths. They are simply my ability to win friends, hustle hard, and learn fast. I started every day by talking to someone who had more knowledge than I did, or researching a new topic. I didn’t know what any of the buzzwords meant or how to do them. I reached out to influencers and started building relationships. I would join mastermind groups, Skype group chats, Facebook groups, anyplace I could go and learn. This lead me to the first step in being a one-man PR team. I soon realized that I was never going to master all that there is to learn. I was determined not to be ignorant of any subject matter. I met experts and found common interests. I became genuinely interested in the “experts” chosen field of mastery. This allowed whomever to which I was speaking, to have an opportunity to shine. Unbeknownst to me it also helped me build relationships with experts and leaders— it did more than just put me in front of them. It helped me give. When I was interviewing leaders, sharing content, giving referrals and leads I was invoking an ancient human law: the law of reciprocity. It states that as you give to someone else—they WANT to give back to you any way they can. (what an outdated metaphor… but you get the jist!) I became friends with bloggers, advertisers, graphic designers, and every profession in between. When your friends are “the best” it pushes you to be the best. Push yourself so hard no one can push you harder. Ever play a sport against a team that is just hugely better? Imagine every day being able to play basketball against LeBron James. Would you get whopped every game? You bet ya! But would you become an awesome basketball player fast? You bet ya! This is pivotal in becoming a one-man PR firm, you must be “good” at all areas of marketing. Not an expert—but competent. You will understand why in a minute. Playing big made me want to achieve big goals. For instance, I failed English in school for my writing abilities or lack thereof. Since then, I became determined to be a top writer and blogger. Let me caveat this by saying to always bet on your strengths. Writing might look like a weakness but in 7th grade I had an 11th grade, 3rd-semester reading level and comprehension. I am an articulate speaker, debater, and storyteller. I massively over indexed in my ability to relate to others and express myself. Writing is just another way to express myself and relate to others. Therefore it should be a strength. It just needed some work. I started blogging as much as I could, with hard work and determination I got better. This excellent ability to write and my network of connections got me into my first major blog, Small Business Trends, with the article How to Brain Hack Your way to be a Success. I leveraged this to get into another major blog: Business2community. 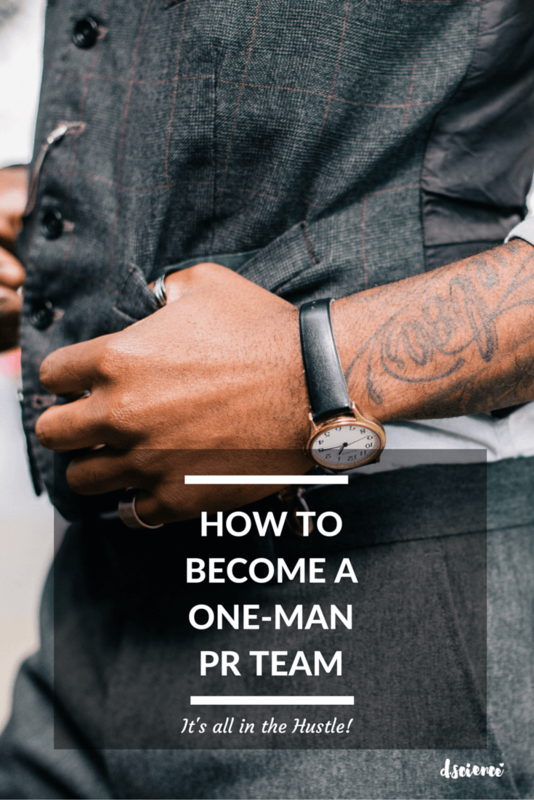 Want to be a one-man PR team? Get on the new social medias like Meerkat, Periscope and Blab. The only person who is going to work full time on your business is you. A PR team will never care about your brand and your business as much as you. They are slow to change and don’t understand how to use new social medias. Periscope and Meerkat allow brands to create their own TV shows. You have the opportunity to broadcast to hundreds and thousands of people from around the world. The entire time you are broadcasting you get real feedback from your customers asking questions and creating brand engagement. Engagement is everything in business. New technologies such as Blab.im allow for 4-way communication with other users. It is a cleaner version of Google Hang-Outs-on-Air. Platforms like blab allow you to connect more easily with influencers. Trying to connect with an influencer on Twitter is nearly impossible. Smaller newer platforms like Blab have only 40 or 50 people in a room. This makes your chances of connecting much greater. Embrace the change and try new platforms. Continue to seek and push. After landing my two major blogs, I decided to put in some legwork and make great content. That being said I still have goals such as being a contributor to major websites like Forbes, Huffington Post, Entrepreneur, and other top niche sites. You know what? You’re right. That being said, there are a few things it does do to help me on my journey. I know how to “pitch” if needed because I know what sites like to see and respectively, what they don’t appreciate. I have an extensive network of contacts in all those sites that I can call upon when I am ready for the next jump. Lastly becoming a one-man PR team doesn’t happen overnight. It takes years, and in my opinion the journey is 90% of the fun. If everything in life came easy it would be boring. If you love this article please share it with the rest of the world. I would be ever so grateful.